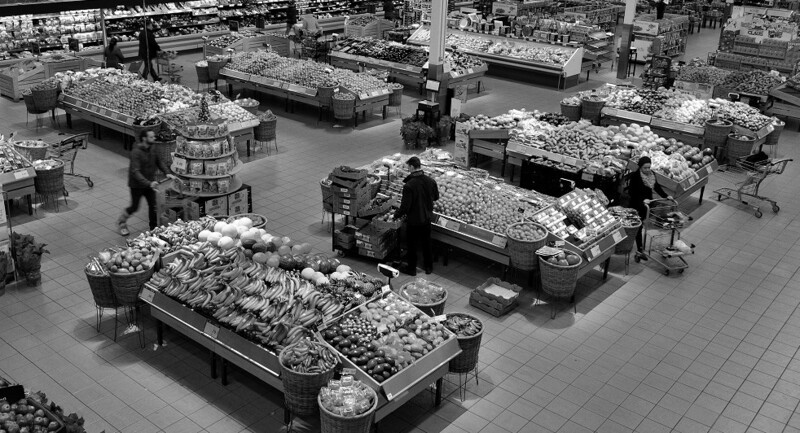 "Supermarket" by [cypher], used under BY-NC-SA 2.0 / Desaturated from original, with colour filter. Big-box retail stores arriving from foreign countries have transformed the way Mexican households shop for goods, sparking a “supermarket revolution”. Traditionally, consumers in developing countries have shopped at street markets and small, independent stores. However, consumers have switched to shopping at foreign retailers, who offer a larger variety of products at cheaper prices. Despite concerns that foreign retailers might adversely affect local employment and household incomes, our evidence shows that allowing them to operate their businesses in Mexico has generated substantial welfare gains for households across the income spectrum by lowering the cost of living, while having limited impacts on total employment, incomes, and local businesses closing. 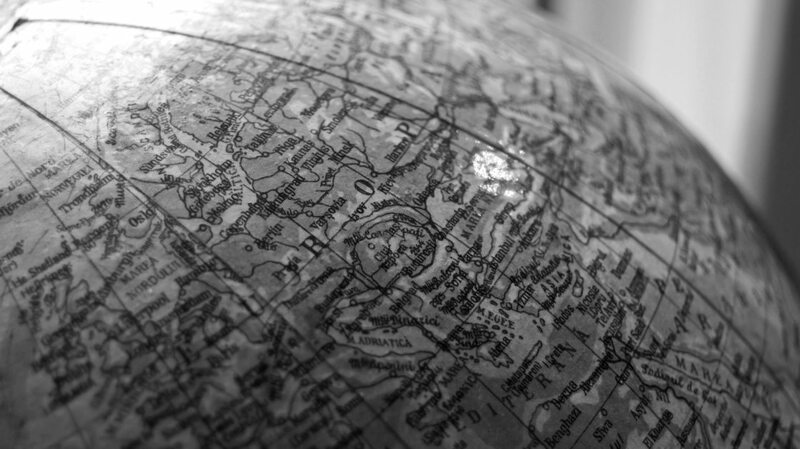 The globalization of the retail market has led to heated policy debates in many countries. Those against foreign retailers are concerned that the arrival of global big-box stores might drive down local wages and employment, pointing to the fact that a substantial share of employment already exists in the traditional street markets and small stores. Those in favor of foreign retailers emphasize the potential benefits to households from lower consumer prices and increased product variety. Importantly, these debates have also led to stark differences in policies toward foreign direct investment (FDI) in retail across developing countries. In the early 1990s, Argentina, Brazil, Mexico, and most of Eastern Europe liberalized retail FDI fully, allowing global businesses to invest in their markets. Other countries have instead taken the opposite route. India, for example, still severely restricts foreign businesses from investing in their country; and Indonesia, Malaysia, and Thailand re-imposed regulatory barriers, such as taxes on imports or zoning restrictions, on foreign retailers after initially allowing businesses to enter the market. These policy decisions matter for household welfare because retail is a key sector of the economy in developing countries, on average accounting for 15­–20 percent of employment, 10–15 percent of GDP, and more than 50 percent of household expenditure, which includes the amount a household spends on everyday needs like food and energy. Allowing foreign retailer entry using the Mexican experience, shows substantial gains to households. We can use this research to inform policymakers worldwide. In our recent research (Atkin, Faber, and Gonzalez-Navarro 2016), we bring together a rich collection of micro data to assess the consequences of foreign retailers entering the market in Mexico. The landscape of Mexican retail underwent a dramatic transformation over the last 20 years as foreign retailers came to dominate the domestic market. Over our study period from 2002 to 2014, the number of foreign supermarkets almost quadrupled from 365 to 1,335. Geographic coverage has expanded beyond major metropolitan areas and into second and third-tier cities. This rapid expansion provides an ideal empirical setting to study impacts of foreign businesses on local markets. 1) What is the effect of foreign business investments on the average household’s welfare in the municipality where the foreign retailer is located? 2) What are the channels underlying this effect? 3) To what extent do the gains from retail FDI differ across the income distribution? Our main finding is that foreign supermarket entry causes large and significant welfare gains for the average household equal to 6 percent of initial household income, which is a substantial effect. Our rich data allows us to distinguish these gains into six distinct channels. Three of these are related to cost of living (household price indices) and three are related to the effects on nominal income, or the amount of a person’s salary paid in cash that doesn’t account for inflation. The majority of the welfare gains come from a significant reduction in the cost of living. First, the entry of a foreign retailer produces an almost 4 percent drop in consumer prices charged by preexisting domestic retailers. This increases welfare by an average of 1.6 percent. Second, consumers also gain from being able to shop at new foreign stores. Foreign retailers on average offer 12 percent lower prices for identical products and more than five times the number of products available in modern domestic stores. After foreign retailers enter the market, they capture one-third of average household spending. The combination of cheaper prices, greater variety, and the different shopping amenities (e.g. more parking, wider aisles, better hygiene) available at foreign stores generates welfare gains of 5.5 percent. Approximately 40 percent of these gains can be accounted for by the cheaper prices at foreign stores alone, the remainder coming from the variety and amenity channels. Third, the entry of foreign retailers also leads to some local stores closing down. This effectively raises the cost of living. We find that 4 percent of domestic stores close down as a result of foreign businesses entering the market. In the median municipality, the number of local domestic retailers falls from 2,088 to 2,007, and this reduces the price index gains by 0.7 percent. Hence, taking all three factors into account, reductions in the cost of living generate welfare gains for the average household of 6.4 percent. The effects on average nominal incomes are very small in comparison. We find no effect on average municipality-level household incomes or employment rates. Thus, there is little support for the often-heard fear that global big-box stores entering the market leads to widespread job losses and lower incomes at the local level. When we zoom in to particular occupations and sectors, however, we do find evidence of adverse effects on domestic store profits (including the closing of small, independent stores), as well as negative employment and labor incomes for people initially working in the traditional retail sector. We show that while these adverse income effects are sizable for those who experience them, they affect only a small fraction of overall households and so in total, only generate welfare losses of 0.4 percent for the average household. Hence, these reductions in nominal incomes are swamped in the aggregate by reductions in the cost of living that benefit everyone, or put more simply, the overall reductions in the cost of living benefit many, while losses to nominal income affect only a few. The average household experiences a 6 percent increase in welfare. Although wealthier households gain more from foreign entry, every income group enjoys positive gains. Because the average effects may mask substantial heterogeneity, or diversity in the results, we also quantify how the effects are spread out across the initial distribution of households. We find that the welfare gains are shared widely, with all household income groups experiencing positive and significant gains from foreign entry on average. However, the effects are also regressive: the richest income groups gain about 50 percent more than the poorest. The key driver of these regressive results is that richer households substitute over 50 percent of their retail consumption into foreign stores, while the poorest households substitute less than 15 percent. These results suggest that richer households value and prefer the product variety, store characteristics and store amenities offered by foreign retailers significantly more than poor households do. One such characteristic is store location, with foreign stores often located outside city centers close to major roads. While this is convenient for richer households with cars, this is less appealing for poorer households whose cost of access is high. In our framework, this force is captured as part of a stronger preference for foreign stores among richer households and hence bigger consumer gains for that group. Overall, when summing the full impacts of foreign retailer entry, we find limited reductions in nominal incomes and employment, coupled with large gains for many households from a lower cost of living. Contrary to policymakers’ fears, we do not find that the entry of foreign retailers led to widespread job losses or lower incomes in the municipalities where foreign businesses invested. One obvious question raised by our findings is to what extent are these effects specific to retail FDI, rather than being driven by modern store formats more generally? To answer this question, we compare the effect of foreign store entry to the effects of domestic retailers using similar “big box” store formats. 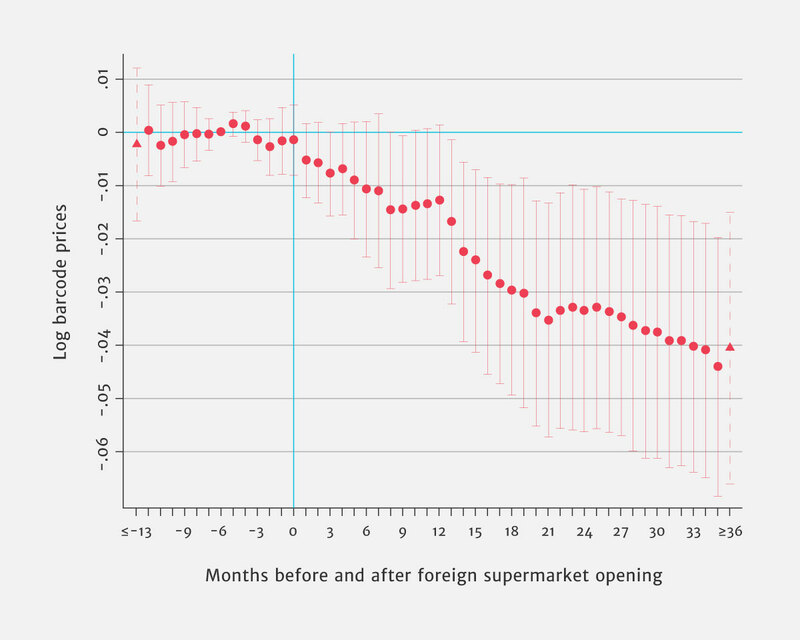 We find that the entry of these domestic retailers does not lower retail prices in preexisting stores, and the market shares after they enter are less than one-third of those estimated for foreign store entry. These results suggest that, at least in Mexico, the welfare gains we find are specific to foreign businesses investing in the market rather than capturing the entry of modern store formats more generally. Our analysis provides a number of insights that relate to ongoing debates about developing country policies towards retail FDI. The findings suggest that policymakers may put too little weight on the potential for reductions in the cost of living that benefit the vast majority of households, both those who end up shopping at the foreign retail stores and those who enjoy price reductions at domestic retailers. Instead the focus is typically on the potentially adverse effects for an important, but nevertheless, select group of households working in the traditional retail sector. Our empirical evidence from Mexico suggests that while these adverse nominal income effects are present when new retailers enter the market, the overall reductions in cost of living on average give rise to real income gains across all household income groups and swamp the adverse effects. This article summarizes “Retail Globalization and Household Welfare: Evidence from Mexico” by David Atkin, Benjamin Faber, and Marco Gonzalez-Navarro forthcoming in the Journal of Political Economy (Chicago University Press). "Art blue boat" by Miguel Á. Padriñán used under CC BY 2.0. Desaturated with colour filter from original and cropped. 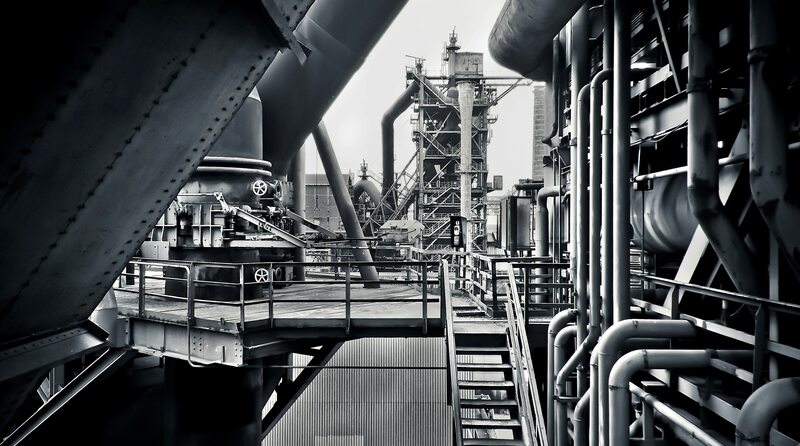 The impact of industrial policy on China’s economic growth has been difficult to assess, in part due to the lack of direct evidence on government support measures, which remain secret. 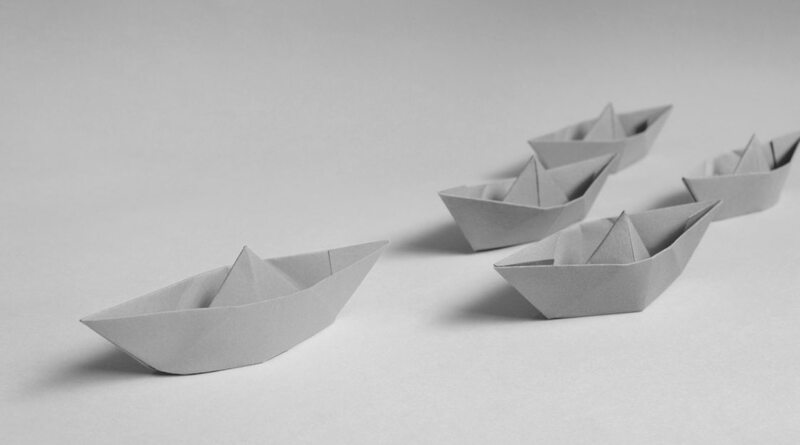 This research uncovers hidden subsidies provided to the Chinese shipbuilding industry, which has more than doubled its global market share in recent years. The subsidies decreased shipyard costs in China by 13-20% between 2006 and 2012, policy interventions that have led to substantial misallocation of global production with no significant gains for consumers. Japan, in particular, has lost market share.